NYT admits fraudulent Syrian human rights group is UK-based "one-man band" funded by EU and one other "European country." One could not fathom a more unreliable, compromised, biased source of information, yet for the past two years, his "Observatory" has served as the sole source of information for the endless torrent of propaganda emanating from the Western media. Perhaps worst of all, is that the United Nations uses this compromised, absurdly overt source of propaganda as the basis for its various reports - at least, that is what the New York Times now claims in their recent article, "A Very Busy Man Behind the Syrian Civil War’s Casualty Count." Photo: From Reuters: "Rami Abdelrahman, head of the Syrian Observatory for Human Rights, leaves the Foreign and Commonwealth Office after meeting Britain's Foreign Secretary, William Hague, in central London November 21, 2011. 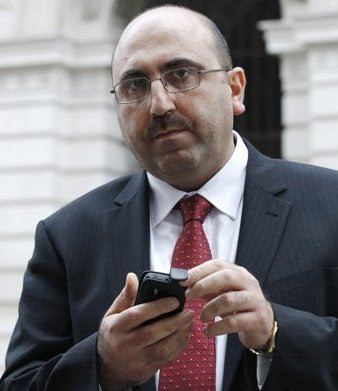 REUTERS/Luke MacGregor" Abdelrahman is not the "head" of the Syrian Observatory for Human Rights, he is the Syrian Observatory for Human Rights, run out of his UK-based house as a one-man operation. Abdul Rahman is not a "human rights activist." He is a paid propagandist. He is no different than the troupe of unsavory, willful liars and traitors provided refuge in Washington and London during the Iraq war and the West's more recent debauchery in Libya, for the sole purpose of supplying Western governments with a constant din of propaganda and intentionally falsified intelligence reports designed specifically to justify the West's hegemonic designs. Abdul Rahman's contemporaries include the notorious Iraqi defector Rafid al-Janabi, codename "Curveball," who now gloats publicly that he invented accusations of Iraqi weapons of mass destruction, the West's casus belli for a 10 year war that ultimately cost over a million lives, including thousands of Western troops, and has left Iraq still to this day in shambles. There's also the lesser known Dr. Sliman Bouchuiguir of Libya, who formed the foundation of the pro-West human rights racket in Benghazi and now openly brags in retrospect that tales of Libyan leader Muammar Qaddafi's atrocities against the Libyan people were likewise invented to give NATO its sought-after impetus to intervene militarily. Unlike in Iraq and Libya, the West has failed categorically to sell military intervention in Syria, and even its covert war has begun to unravel as the public becomes increasingly aware that the so-called "pro-democracy rebels" the West has been arming for years are in fact sectarian extremists fighting under the banner of Al Qaeda. The charade that is the "Syrian Observatory for Human Rights" is also unraveling. It is unlikely that the New York Times' limited hangout will convince readers that Rami Abdul Rahman is anything other than another "Curveball" helping the corporate-financier elite of Wall Street and London sell another unnecessary war to the public.